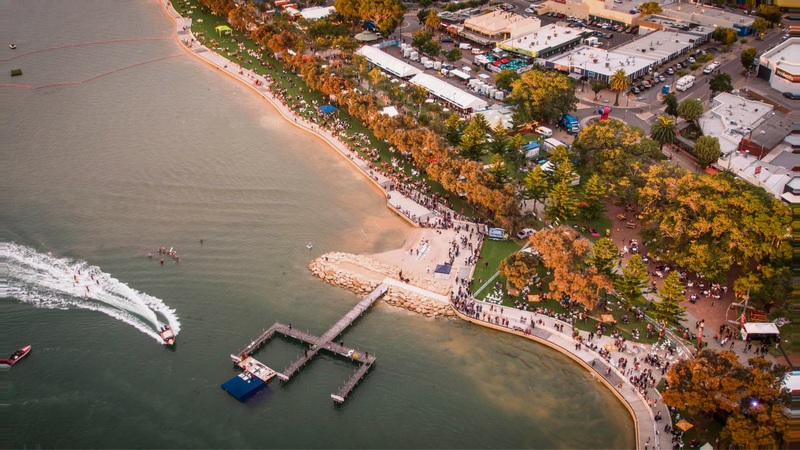 THE Mandurah Crab Fest was a success, according to organisers. Highlight acts such as Justice Crew and Thirsty Merc were a big hit with the crowds. More than 40 children took part in the Children’s Dress Up competition. Emma Blyth auctioned off her signature 2017 Crab Fest artwork, raising $5400 for Mandurah Primary School. Ticketed events such as Fervor’s Dinner Under the Stars (sold out), the Progressive Dinner Cruise (sold out), the High Tea and Crab Boil were all well attended. Almost 30 artists took part in the En Plein Air Art Competition, using different mediums including cloth, oil, acrylics, watercolour and even a body painter. Jos Coufreur won the contemporary category, Leon Holmes won the traditional category and Lulu Ball won the people’s choice. The spectacular fireworks dazzled on Saturday night. Mandurah Mayor Marina Vergone said Crab Fest goes from strength to strength each year. “We’re so happy to have built on our successes to deliver another highlight festival that was enjoyed by thousands of local, national and international visitors,” she said. “It was really lovely to see so many people out and about in our beautiful city, and enjoying the newly redeveloped Eastern Foreshore seawall too.